There has been much talk here in Virginia about a new winery opening on a centuries-old property in Prince William County. Much of the discussion is about who is launching the winery, but just as much chatter has been about the delays in getting the operation open. What’s amazing is that despite not one drop of wine being served on that property, the winery has already begun racking up awards. I recently sat down to talk with esteemed vintner, industry leader, entrepreneur and history buff Chris Pearmund on a rainy day at the property of his future winery, Effingham Manor. Actually, the skies literally dumped rain as soon as I parked, but the estate was no less stunning despite my making a run for cover to where Pearmund was sitting. Chris Pearmund has a pretty impressive resumé with regard to his involvement in cultivating grapes and winemaking; he has launched no fewer than 15 wineries in the Mid-Atlantic (about 11 of them in Virginia), and many of them with particular attention paid to properties’ historical integrity. 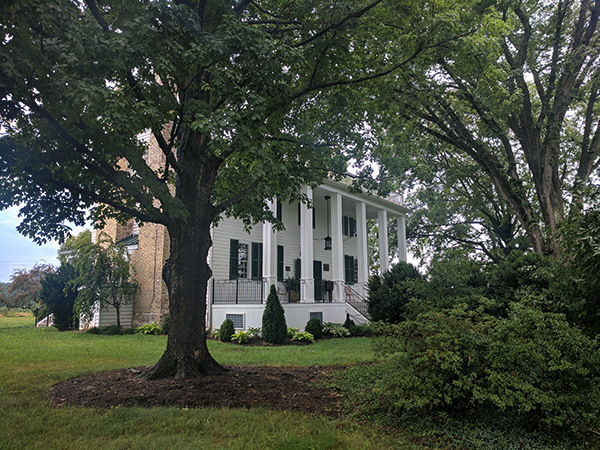 Effingham Manor dates back to approximately 1767, when it was built by William Alexander, great grandson of John Alexander (namesake of Alexandria, VA) and a lieutenant colonel in the Prince William militia during the Revolutionary War. It is on the National Register of Historic Places, and besides the manor house the property includes a brown sandstone blacksmith building, a smokehouse and slave quarters, and supposedly the first terraced garden as well as concrete pool (now a fully stocked koi pond) in Virginia. Every detail has been thought out: The design and the selection of stone used on the newly built patio and structure where visitors will do tastings, lounge by a fireplace and in seating areas or view the fermentation and barrel room has all been done to match or closely resemble other structures on the property. Inside the manor house floors have been refinished, antique artifacts and furnishings are in place. Chambourcin vines have been planted just behind the main buildings and are doing well. And Pearmund has utilized winemaker Ashton Lough, who is integral in the top-notch wines produced at Pearmund Cellars and Vint Hill Craft Winery. According to Pearmund, some of the earliest known vinifera “vines were brought over from Europe in the 1600s to make wine—thereby eliminating the need to ship alcohol across the Atlantic as well as to generate tax revenue from the sales of wines.” In fact, starting as early as 1619 laws were passed whereby landowners were required to plant specific minimums of grape vines along with their other crops. But it wasn’t easy. For a couple of centuries farmers struggled with the humid climate, soil conditions, diseases, etc. But the colonists were persistent! By the 1800s real progress took place, from the discovery of the native Virginia grape, the Norton (one of my favorite varietals), to the grafting of European vines to make them more resilient to Virginia’s harsh growing conditions. A wine industry was born. Fast forward through the 20th century, from struggles during prohibition to the second act of Virginia’s wine industry starting in 1967 and really taking off in the ′80s…. This is where Pearmund enters into the Commonwealth’s wine story. Besides launching multiple wineries, Chris Pearmund has spearheaded many wine industry programs, such as barrel ownership for wine club members and the Virginia Vineyard Insurance program; he has held prestigious positions (such as president of the Virginia Vineyards Association for approximately four years and board member of the Virginia Wineries Association) and is a nationally certified wine judge by the American Wine Society. Additionally, Chris Pearmund has unequivocally been one of the biggest advocates for Virginia winegrowers and Virginia farmers/agriculturalists. I tell you some of his backstory because it is so relevant to Effingham Manor’s existence. I won’t go into all of the details of the issues Pearmund has experienced trying to open the winery, but a major roadblock has been pushback from a few very vocal (and seemingly deep-pocketed) homeowners in the Alexander Lakes HOA—a subdivision in which Effingham Manor sits. Based on positive experiences with his other historical winery ventures (Winery at La Grange, Winery at Bull Run and Vint Hill Craft Winery) as well as wineries within proximity to residential properties (La Grange, Pearmund Cellars, Paradise Springs) it seems counter-intuitive to block such a venture because according to Pearmund’s experience “wineries have always increased residential property values” when in close proximity to each other. And I can find no documentation proving that wineries are detrimental to communities and road safety. Furthermore, what fascinates me is that back in 2007 (years before Chris Pearmund and his partners expressed an interest in purchasing Effingham Manor), a Special Use Permit was granted for the property and as such it would have been licensed to operate as a B&B and allowed up to 300 guests to attend tented, outdoor events with portable toilets and live music on the property. Chris Pearmund has tried to work with the county and appease any pushback from residents by improving the property visually, limiting events to indoors with a maximum of 150 guests, and prohibiting porta-potties and outdoor music. 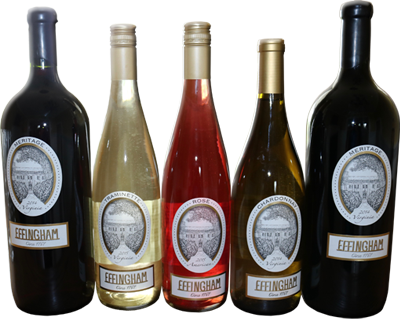 One thing that Pearmund stated is that Effingham Manor Winery, which at one time was comprised of approximately 30,000 acres, will continue the agricultural tradition of the estate. When I asked him what he envisions for the winery in the future, he remarked that there are approximately 15 acres adjacent to the property and he would like to purchase the land and plant grapevines—ensuring that no future development of structures would go there and maintaining the rural aesthetic for residents. Sadly a few opposing neighbors are stopping that. As if on cue, the rains subsided and John Memoli, General Manager at Pearmund Cellars as well as Effingham Manor, joined the conversation and then offered to give me a tour of the manor and property. Worth noting is that both men remarked that Effingham Manor will soon be accessible to the public, so visitors will be able to explore the historic property. At this time no wine will be poured by staff and sampled in the manor house, but rooms will be public so that guests can purchase wine in the events building and enjoy it in the house, on the porches and on the grounds. About six weeks ago the courts ruled in favor of Pearmund and Effingham Manor Winery and as of press time they are awaiting the formal ABC license. Hopefully it will not be much longer until the doors open to the public and we can finally enjoy the fruits of so much labor. The manor house is a Tidewater-style structure with double chimneys at eat end.